On the day I meet him, Rakesh Jhunjhunwala is front-page news. He has just told ET Now, a new financial news channel, that he thinks India’s Sensex index will touch the 19,000-point mark before the end of this year. That would be a 30 per cent rise from today’s prices, even during global economic turmoil, and it has won him the top spot on both the channel and the website of the Economic Times, its sister paper. This is exactly the kind of call that made Mr Jhunjhunwala the star of India’s bull run between 2003 and last year’s market crash, and the most sought-after commentator on India’s budget unveiled last week. He was one of the few businessmen willing to publicly criticise a budget many felt would be bad for investors. When I am ushered into his office, his bulky frame is propped up in front of three screens of flickering red and green stock prices. His eyes do not leave the constantly updating quotes for more than 15 seconds at any point in the interview. It seems that I am lucky to get even half of his attention. In 2005, when the Sensex had tipped above 5,000, Mr Jhunjhunwala declared it could hit 25,000 within five to six years. That brash prediction, not to mention his larger-than-life persona, helped him become a fixture on India’s financial news networks. And he came close to seeing what some considered a ridiculously bullish forecast come true. At the end of the bull run in January last year, the Sensex had passed 21,000. 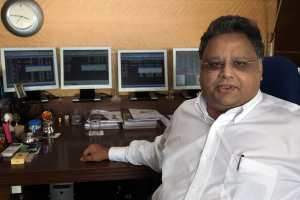 Since the market crash, the 31 publicly traded stocks of which Mr Jhunjhunwala holds more than a 1 per cent stake lost about 60 per cent of their combined value, even underperforming the Sensex. Doing so has resulted in him losing much of the paper wealth that propelled him into the Forbes Rich List last year. “I have much less than what most people think, but much more than I need,” he tells me. Mr Jhunjhunwala is frequently dubbed “India’s Warren Buffett”, but in many ways the two could not be more different. The Oracle of Omaha is a teetotaller and a non-smoker. Mr Jhunjhunwala constantly alternates between his preferred 555 cigarettes, sweet chewing paan and Indian snacks. He is known for his taste for cigars and Blue Label whisky. While Mr Buffett still lives in the same house in Omaha he had when he began, Mr Jhunjhunwala has moved his family into a plush flat in Mumbai’s upmarket Malabar Hill neighbourhood. The only time he breaks away from his trading screens is when he shows me a slide show of his mountain-top mansion in the Mumbai hill station of Lonavla, one designed by the Indian architect Nitin Killawala. Like Mr Buffett, however, Mr Jhunjhunwala is primarily a value investor and both are willing to share their investments and the rationale behind them with the public. He entered the market in 1984, aged 25, with a 5,000-rupee investment (equivalent to about Dh1,000 today) in the iron-ore exporter Sesa Goa. Just three years later, he had turned that into 10 million rupees.